These days, internet connection are pretty stable, but from now and then a loss of signal, power outage or other unforeseen events might happen, leaving your connection unprotected for a few moment. To make sure that you’re not exposed, we strongly recommend using Vuze Bittorrent Client for all your torrenting activity. Vuze is the only torrent client that has the option to only be active while the VPN connection is online aka as a kill switch. After the settings are set, you’re ready to go! Make sure to test if its working properly by killing the VPN connection and check if the torrent is stopped. Download Vuze Leap from http://www.vuze.com/vuze-leap/ . Please note that the OSX version is not out yet, but there are other options that we will address next in this guide. 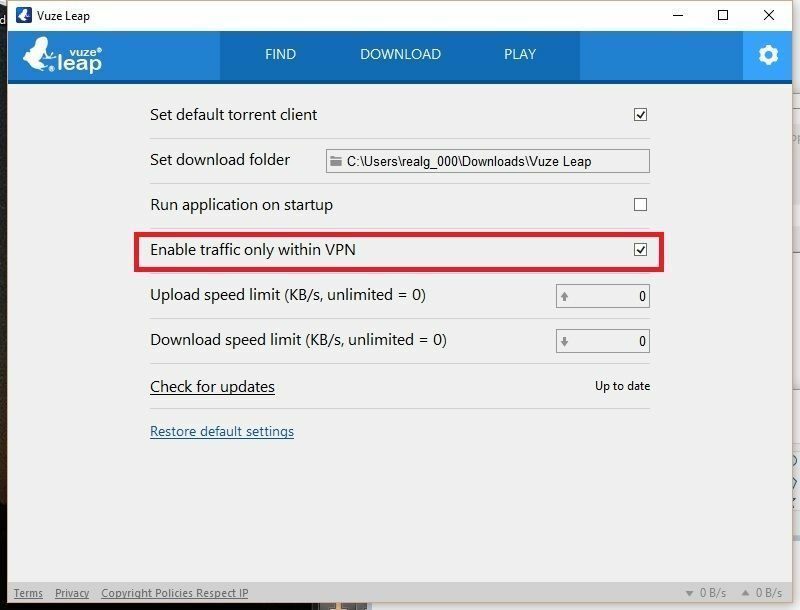 After you install Vuze, make sure to go to settings and check the “Enable traffic only within VPN” , as you can see in the image bellow. 3. Select “Advanced” from the Mode Menu. 4. Go to “Connection” > “Advanced Network Settings“. Search for the “tun0” and type the interface id in the “Bind to local IP address or interface“. Next, Check “Enforce IP Bindings…” and click “Save“.